Sovereign Grace and Caimie Tsukino like this. I saw your in-depth crafting guides, so I have a quick question! Does anyone know what the formulas for crafting are? For example, If I have X amount of control/craftsmanship, and am working on item Y, how would I predict what my numbers will be? I'm having surprisingly difficult time finding this information and I figured if anyone knew, you would. 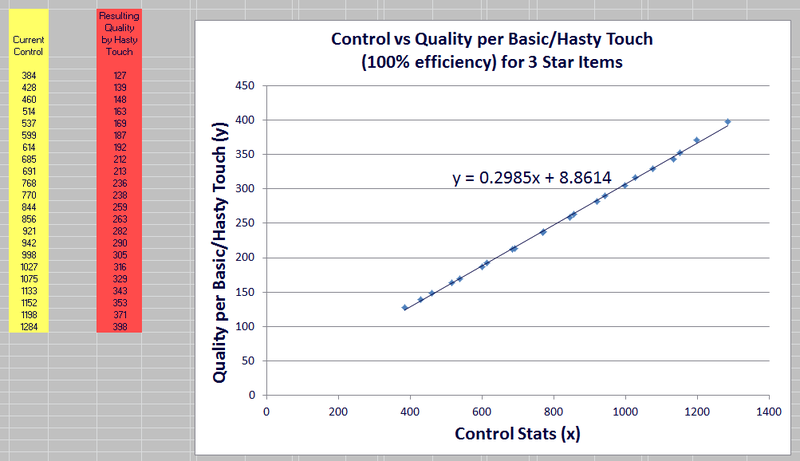 Thus, I have given up on doing this as well, and just collected data on IQ stack vs Byregot power for a 3 star crafter in Ch28. It's old data from Patch 2.2, but still roughly applies even when our stats are now stronger. Really? That's a shame. I can never figure out why they don't make it simple and easy to understand. Hello Caimie! Just a quick question to see your opinion about the new "Specialist" system that will release in Heavensward. What do you think about it? And how do you think it will affect the future of crafting in the game? Jinzuku, racooperii and Hermes like this. Najla, Hermes and GeekMatt like this. GeekMatt and Caimie Tsukino like this. It's also very interesting how, even though of course a lot of your posts are crafting related, your threads have given me a lot of insight into the game as a whole in the time while I wasn't playing (last July-November-ish). Crafting has a lot of influence on, and is influenced by, the whole flow of the game, which is surely as big a success as SE could have been hoping for. Got my 1st Lucris crafting tool! Wow, this thing is mad strong! 31 extra craftsmanship and 14 extra control! Crimson Requiem, Hermes and Jinzuku like this. I just got mine today too! They're strong and pretty! I like 'em! Trust me, get involved in our friday nite raids! We have a lot of fun being silly and stuff. I am in the game right now. Jedrek, Fybrile and Jinzuku like this. Hello, I've been following your crafting guide and it has been really helpful thanks a bunch for taking the time to do this and share it with us. I do have a question regarding the HQ success rate and the graph you posted, I was wondering if you had the spreadsheet and accompanying data for it available to share? If not how many data points did you take to create that graph? Fybrile and JMATAWWCL like this. Hope you're having a wonderful holiday and talk to you soon! Fybrile and Caimie Tsukino like this. I am on the plane right now! Taking off in minutesss!!! Gonna miss you cat sister! "'cuz I'm leaving on a jet plane, I don't know if I'll be back again"
An HQ amethyst ring was crafted right in front of me, and there he proposed! CJ_pt, praysolace, Najla and 1 other person like this. Wedding will have to happen in late Jan! I am on my way to holidays now! Woot! Woot! Welcome to the team! See you in 2015! It's under the Your Account tab, Account Services, Retainer Service. Hi Caimie thx for the great crafting guide. I love it. I tried ur macro sequence and everything is fine only that it keeps saying that Inner Quite is not a valid command. I dunno whats wrong. Can you help me? Tanked and beat my 1st Ex primal as a PLD - Garuda Ex downed! Thanks to my friends being so patient with me during my learning process! Rosco Hostile, Jinzuku, GeekMatt and 3 others like this. Way to go! That's a hard tank fight!